Meredith Richards speaking at the Senior Center in Charlottesville. Across the nation, people are demanding more passenger rail service. Virginia is a national leader in funding rail infrastructure and Amtrak services. Six state-supported Amtrak trains connect Virginia to the Northeast Corridor. These are among the most profitable routes in the nation. Charlottesville is one of Virginia’s strongest passenger rail markets in terms of ridership. It has direct, daily trains north to Washington, New York and Boston and south to Charlotte, Atlanta and New Orleans, with east-west service to Chicago three days a week. Future expansions of Charlottesville Amtrak service will require major upgrades to the Charlottesville station. Passenger rail service is improving, but freight rail is a different story. The unprecedented recent decline in demand for coal is having a dramatic effect upon America’s Class I Railroads, which are responding with a policy of retrenchment. This raises questions about the future of rail in Virginia and creates significant public policy challenges for the Commonwealth. Meredith Richards is a former Charlottesville City Councilor (1996-2004) and vice mayor who has specialized in transportation public policy during her public career. She served three terms as president of Virginians for High Speed Rail and currently serves as its co-chair. Meredith is also president of the Virginia Rail Policy Institute. She formerly served as a member of Governor Mark Warner’s Commission on Rail Enhancement for the 21st Century and was president of the Virginia Transit Association from 1998-2000. 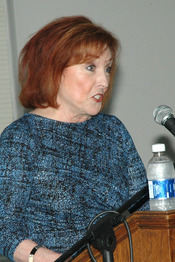 While in elective office, Meredith served on regional and statewide boards, including the Charlottesville-Albemarle MPO, the Thomas Jefferson Planning District Commission, the Thomas Jefferson Partnership for Economic Development, Virginia First Cities Coalition and the Virginia Municipal League. Meredith founded and is chairman of CvilleRail, a nonprofit that promotes enhanced passenger rail for Central Virginia, and she established the Piedmont Rail Coalition, a consortium of local governments, economic development authorities, organizations, businesses and citizens throughout Virginia’s US 29 corridor who work together to bring more frequent and accessible passenger rail to the region. Meredith holds a Ph.D. in Psychology from the University of Illinois and is a former faculty member of the University of Virginia and the University of Louisville. Ms. Richards spoke at the Wednesday June 8, 2016 meeting of the Senior Statesmen of Virginia. The meeting was held at the Senior Center in Charlottesville. Following the presentation, questions were taken from the audience. The program was moderated by SSV board member Rich DeMong. Editor’s Note: Following this podcast the speaker advised us that Charlottesville is the largest ridership station in Virginia on the Crescent train, not that Charlottesville has the largest ridership of any station on the entire Crescent route which is incorrect. Thanks for printing my correction. Not to brag about lil’ ole Cville, but we DO have the highest ridership of any other station on the Lynchburg Northeast Regional. Even stations like Washington, DC, Philly, Baltimore and NY Penn don’t have higher numbers of passengers on the NER than Charlottesville. We are just a train ridin’ town!